Rodger Harkins believes a quartet of contenders at the World Indoors in the United States can once again demonstrate that Scottish athletes are earning their stripes. The GB and NI team in Portland, Oregon, features double European medallists Chris O’Hare and Lynsey Sharp as well as Delhi 2010 Commonwealth Games medallist Steph Twell and rejuvenated Josephine Moultrie, pictured below, in the same 3000m event. It is the second successive World Indoors where the British team has featured a four-strong Scottish contingent – with that number the largest representation in the history of the global indoors event. And while Harkins, who guided Lee McConell to the Olympic Games three times and is now Director of Coaching with scottishathletics, wants all four to demonstrate their prowess in Portland he sees it as a crucial staging post on the road to the summer Olympics in Rio, too. “We’re delighted to have four athletes away in Portland with Team GB,” said Harkins. 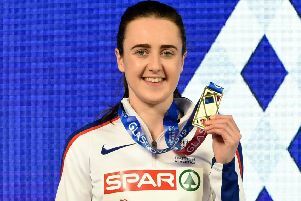 “I understand that matches our contingent two years ago and is the largest representation Scotland has had in a GB and NI team for the World Indoors event. “That speaks for itself in saying once again that there are a number of really good athletes in the current crop of Scots – and they are well capable of competing at a very high level. We wish them well in their aspirations to perform when it counts in the United States. If that means being a medal contender, getting a PB, reaching a final or simply picking up on the experience of competing at an event like the World Indoors then I’m sure all four can take something from it. O’Hare is the only one of the four who competed at the World Indoors in Sopot in 2014 alongside Laura Muir, Eilidh Child and Jamie Bowie – with the latter duo picking up relay medals. Eilish McColgan was also selected that year but had to pull out. This time O’Hare competes at 1500m, Sharp at 800m and Twell and Moultrie in the 3000m after making it a Scots 1-2 in that event at the British Championships in Sheffield last month. The GB and NI team numbers 23 in total. “Steph Twell has had a really good winter and this is a fair reward for her work,” said Harkins. “Steph ran so well in Glasgow at the Grand Prix event and then took the 3000m title in Sheffield. She’s following on from the success of last year in reaching the World final at 5000m in Beijing. “I’m pleased for Jo Moultrie making this team and getting this opportunity with GB. Again, she has worked really hard to achieve this. She came back to a GB vest in cross country after six years away and then performed well indoors. Sharp hasn’t raced much indoors in her elite career – but holds nationals records both outdoors and indoors and is looking for pointers ahead of the Rio Olympics. “In terms of Lynsey Sharp it is a bit of a learning curve indoors. She had not done an indoor season for three years and then came out and ran a Scottish National Indoor record and duly made the team,” said Harkins. “I think the conversation with her coach was about: ‘what can be learned?’. “Indoors at 800m has less margin for error than outdoors. You have to make quicker decisions on tactics and in that sense it is a hotbed of fast learning. I am sure Lynsey will look to this and say: I can take things from this for the summer and the road to Rio. “Chris has of course operated in the States for a number of years and is well-versed in indoor running. He’d that great mile run at the Millrose Games and we always know with Chris that he will leave out nothing in terms of fighting to be a contender. I am looking forward to seeing him at 1500m and of course he medalled indoors at the Europeans last year. Hopefully for all four it is a positive experience en route to the summer season. Thoirs was only the third Scot to win a NCAA gold, the others being O’Hare in 2012 and thrower Meg Ritchie back in 1983.